The worldwide family of the Indigenous People of Biafra (IPOB) and it's leadership, under the supreme command of Mazi Nnamdi Kanu consider it imperative to restate the reasons why Biafrans have decided to lock down Anambra State on the 18th of November 2017 and never to participate in any fraudulent elections organised by INEC until a date for referendum on Biafra is set. It is patently clear to all that since the return to what can best be described as the Arewa dominated militocracy in 1999, we Biafrans have been voting with nothing to show for it till date. In fact, the whole electoral exercise in Nigeria is as fraudulent as Nigeria itself. INEC is anything but independent. People can campaign and electioneer all they like, Aso Rock decides who gets appointed into political office. Our votes don't count and will never count. Those participating in elections in Nigeria under the crazy militaristic Northern constitution drawn up by a Northern Islamic military head of state Abdulsalami Abubakar for the benefit of the Muslim North are either ignorant of what democracy entails or they are guilty of engaging in willful hypocrisy. Nigeria runs a very corrupt quasi military feudalism modeled on the subservient ethos of the Hausa Fulani traditional emirate system of governance. That we call rulers of states in Nigeria governors or the fact they belong to political parties with stipulated tenure in office doesn't remove the fact that they are in effect glorified Emirs answering to the new Sultanate Aso Rock instead of Sokoto. What obtains in Nigeria is not democracy, electioneering or voting, what we have is a carefully choreographed display of primitively nauseating politics of the jungle. No reasonable person can point to a singular benefit of the much trumpeted dividend of democracy till date. Even the emergence of Buhari at the ballot box was characterised by such brazen rigging by 4 year olds in the North that Western election observers were repulsed to conclude that it would be better and less shameful not to mention it. This is the same electoral climate you expect IPOB, the children of light to participate in. It is on record and well documented that during the electioneering campaign in 2014 that brought Chief Willie Obiano to power, our leader Mazi Nnamdi Kanu went on air on Radio Biafra during the eve of election broadcast to urge Biafrans to keep APC Islamic Party out of Biafraland by voting for Obiano's APGA. 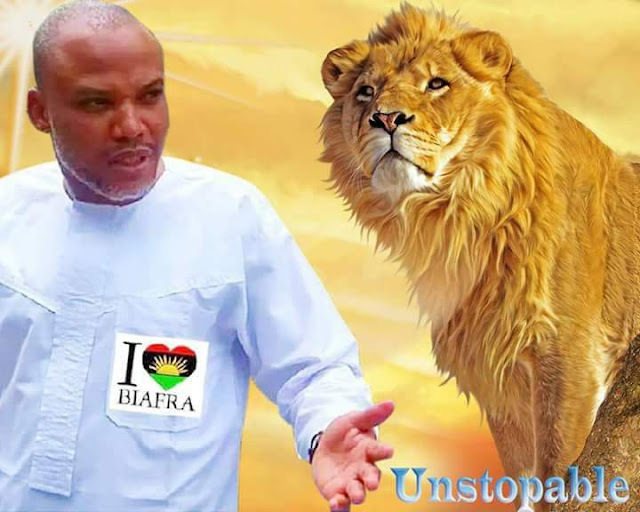 Radio Biafra extended the usual 3 hour evening program to 5 hours to ensure that every nook and cranny of Anambra State was saturated with the message of keep APC out. But what did Nnamdi Kanu and IPOB get in return for campaigning door to door and getting Obiano elected? Yes, we got massacre after massacre, killing after killing, detention without trial, one Northern Islamic military operation after another. We committed no crime, we did not kill anybody but that did not stop Obiano from liaising with the murderers in Aso Rock to kill our people. Ask Obiano today what crime did IPOB commit to warrant such heavy handed persecution and he would tell you nothing. Obiano felt that the best way to prove his One Nigeria credentials and loyalty to the Caliphate is by ordering the killing of the same people that campaigned and voted him into power. The killing of IPOB family members in Anambra State started on August 30, 2015 at Uga Junction by Atani Road Onitsha, then on the 2nd and 17th of December 2015 at Head Bridge Onitsha, May 29 and 30 at Nkpor in Idemili North during the celebration and remembrance of our fallen heroes and heroines which resulted in mass burial of our people by the Nigerian Army inside the grounds of Onitsha Military Barracks. Obiano rewarded the military at Onitsha barracks by donating new vehicles and equipments to them to thank them for a job well done. IPOB did nothing to provoke Obiano, only if you consider evangelism as a security threat. Willie Obiano turned back and bit the finger that fed him at time of need. These are the same people asking us today to go and vote for them again, as if we are dumb and stupid. Any political party using the name of IPOB or our leader to curry favour with the masses by claiming we are supporting him is only deceiving the people. 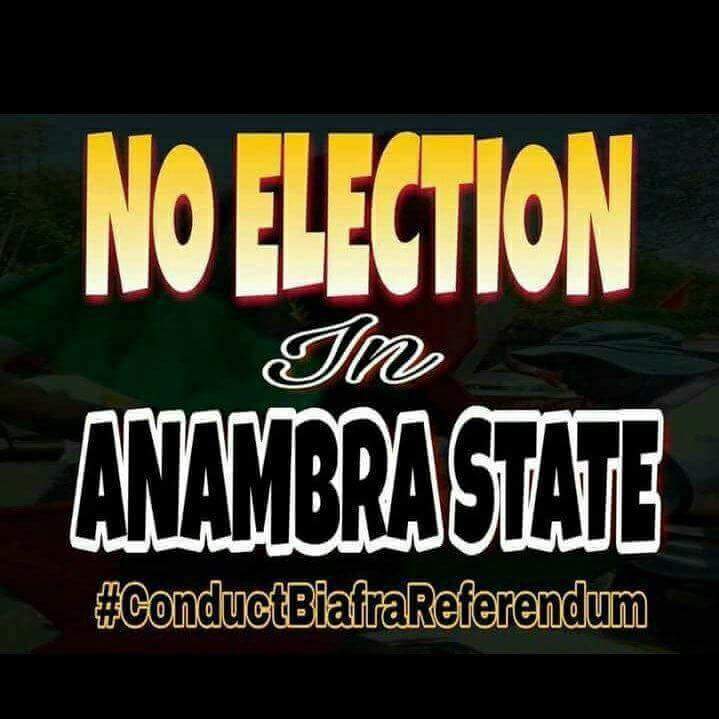 Our leader made it clear in countless rallies and interviews before soldiers stormed his house and took him away, that Anambra elections must be boycotted at all cost. Successful boycott of Saturday's elections will register our displeasure towards the attitude of politicians in the South East especially and Biafraland at large. Over the years, we have been told repeatedly to hold our politicians to account, we have therefore selected 18 November 2017 as a perfect date and setting to let the world know how disappointed we are in all of them. It will mark the beginning of a silent revolution that will usher in a new era of freedom and accountability, not just for Biafrans, but for all component ethnic nationalities in Nigeria. IPOB cannot participate in an electoral process where Aso Rock through INEC simply compile their own figures and declare whoever they like winner. Such political banditry will end in Nigeria on Saturday. It is therefore in the interest of democracy, good governance and accountability that all right thinking and courageous people join IPOB to cleanse the political landscape by boycotting elections in Anambra State on Saturday 18 November 2017. If other nationalities in Nigeria wake up to realise what IPOB have discovered, that power does indeed reside with the people and boycott all future elections, it will trigger a constitutional crisis that will lead to a renegotiated and people oriented governing constitution for Nigeria. This is simple common sense. Waiting for the same corrupt, lazy, oil dependent, repressive government of mediocrity to change their ways by voting for every four years, is nothing short of delusion. The more you vote, the more they take you for granted. Enough is enough, let the revolution to free the enslaved masses begin this Saturday. IPOB will only allow voting in Biafraland if and when a referendum date is agreed to determine the fate of Biafra independence. We the people are demanding freedom and freedom we must have.